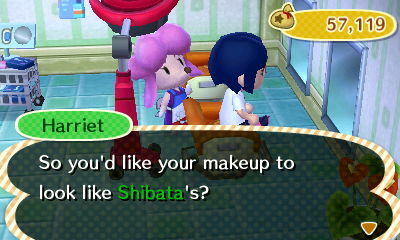 Once Shampoodle's has been opened, you can get one makeover per player each day. Your options are Hairstyle, Makeup and Color contacts. They each cost 3000 Bells. 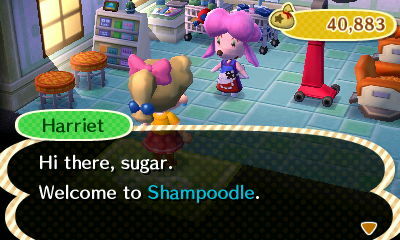 Please refer to the Town Ordinances Guide to find out when your Shampoodle's is open for business. 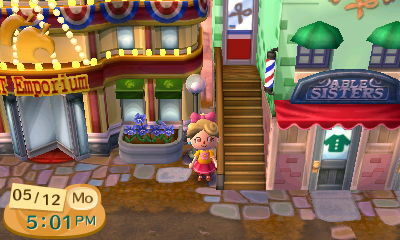 You can get a new hairstyle and a new hair color. 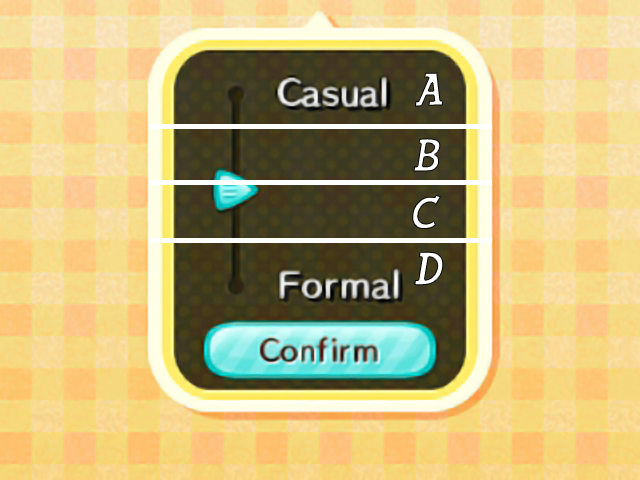 This option allows you to select a new Mii mask, which will replace a previously selected mask. This option allows you to change your eye color. After having visited Harriet a number of times, you will occasionally get the option to select the opposite gender's hairstyle. If you haven't played for 15 days (or you have time travelled for as many days), you'll get bedhead. This style is shown at the bottom of the hairstyle table. Getting bedhead won't change your hair color. When you begin selecting your hairstyle, Harriet will ask you what overall look you are hoping for. A slider will appear, with Casual at the top and Formal at the bottom. The slider is subdivided into four equal sections, which are denoted by the character A-D, where A is the topmost section and D the bottommost. The initial position, which looks like it's centered, is in section C. So, if that's the formality you're intending, don't move the slider. If you wish to select section A, move the slider all the way up. Section B: move the slider up by a small distance from the original position. Section D: move the slider all the way down. If you accidentally moved the slider and hence have lost the initial position, start all over again. Or just make an estimate; it's not too hard. Your choice on the slider causes Harriet to ask a question, with two possible responses. Your answer to the first question will cause Harriet to ask a second question, also with two possible responses. So altogether, there are 4x2x2 = 16 possible hairstyles for each gender. When selecting the lowest/last of each option, you can choose betwen three options. If you answer "It's a secret", you will get a random hairstyle. The table below shows all the possible slider positions and answers and the resulting different hairstyles. ABA A Stylish side I'm a role model! ABB A Stylish side I like being left alone! BAA B It's on the messy side. I wish I could clean it. BAB B It's on the messy side. It's on purpose! BBA B My room is clean! I like to style my hair! BBB B My room is clean! Natural is best! CAA C I'm very serious! Fight and overcome! CAB C I'm very serious! Grin and bear it! CBA C I'm a troublemaker! I'll settle down. CBB C I'm a troublemaker! Rebel for life! DBA D Private! It's a party! DBB D Private! It's a date! Bedhead Not playing for 15 days or more. After choosing your hairstyle, Harriet asks you what color you would like your hair to be. She first asks you what kind of color you would like. You are given 3 options - Natural, Intense, or Bright. If you choose Natural you will get a slider with different values. If you choose Intense or Bright you will get a question with four possible answers. Your choices will determine your hair color. Selecting a hair color using the Intense and Bright hair color options is easier than using the Natural option, because you just get four options to choose from and you won't have to use that finicky slider. When you've chosen your hair color and you're uncertain whether it went ok, you'll get the opportunity to select the hair color all over again. The slider to select the different Natural hair colors works similarly to the slider for the hairstyles, only the color slider is subdivided into eight equal sections instead of four, which makes it harder to handle. The color slider sections are denoted by the numbers 1-8, where 1 is the topmost and 8 the bottommost section. The initial slider position is at the top of section 5. So, it's very easy to select section 1 (slider at the top), section 5 (slider at initial position), and section 8 (slider at the bottom). The other sections are harder to select. Please use the table at the left to help you select the section you are aiming for. The other two tables show the options and the results for the Intense and Bright hair colors. This option allows you to select a new Mii mask, which will replace a previously selected mask. You can choose between the masks that are stored in Mii maker, so you need to make the mask first in Mii maker to be able to select it at Shampoodle's. You can wear the mask and it will cover your entire head. It's really a mask in the sense that you won't be able to have facial expressions: your eyes won't blink and your mouth won't move. In the Welcome amiibo version of New Leaf, your limbs will get the same skin color as the Mii mask; before the update, the skin color of your limbs didn't change when donning the mask. If you've opted for "Color contacts", Harriet will ask you two questions to specify your eye color. Each question has three possible answers, hence there are nine eye colors; however, some are only very subtly different from each other. You get no second chance to select eye color, so choose carefully. The table below shows all possible eye color outcomes.